A unique and heartbreaking memoir of a child's imprisonment in a Japanese POW camp during World War II. '1942: It was towards the middle of the year when my friends started disappearing...'On the island of Java, the stirrings of the Second World War in Europe and the angry-looking man called Hitler seem a million miles away from Norwegian-born Lise and her siblings. 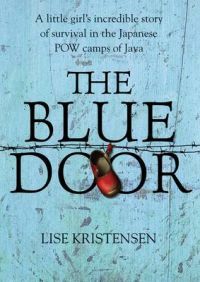 Then one day, her friends and neighbours start to disappear, and she begins to realise that they are not safe after all.Through ten-year-old eyes, Lise tells of her family's two-year imprisonment in POW camps and the brutal treatment received at the hands of their Japanese captors. For respite from the rat-infested floor of their shelter they adopt a blue door, which sits on concrete posts in the ground. They live on it during the day as young Lise plots ways to protect her family from disease, starvation and the desperate behaviour of fellow prisoners. This is a little girl's heartbreaking tale of survival. Lise Kristensen was born Lise Gronn-Nielsen in Java, Indonesia 1934, of Norwegian parents. During the Second World War, she and her family were held for over two years in Japanese prisoner-of-war camps.After the war they moved to Norway. She was educated in Norway and Germany before qualifying and working as a secretary and then a gymnastics teacher. She went on to study art and became a painter, exhibiting and selling her work in Europe, the USA and Japan. She now lives in Spain with her husband.